To breathe—from our very first breath to our last—is to be alive. But for billions of people around the world, that simple, necessary act is at risk due to pollution. For the hundreds of millions of children and adults with asthma struggling to breathe, the immediate and acute experience of breathing polluted air cannot be mistaken. And scientific research tells us that air pollution is also cutting short the lives of an estimated 7 million people a year due to heart attacks, stroke and respiratory diseases. For some context, that is more than the total lives lost to HIV/AIDS, malaria and tuberculosis combined. Everyone on this earth has a right to breathe healthy air. But today, too many countries around the world are facing serious air pollution crises. That’s why people from all around the world—government officials, civil society organizations, artists, and academics—have gathered this week in Geneva, Switzerland for the first World Health Organization Global Conference on Air Pollution and Health. 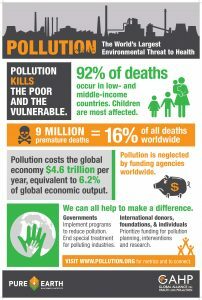 And it’s why we’re here: to call for urgent and immediate action to address global air pollution. EPA Administrator Scott Pruitt unveiled his “secret science” initiative yesterday at a press conference to which no press were invited. While EPA has yet to post the proposed rule or otherwise make it available to the public, it was made available by others. The main thrust of the proposal is actually considerably different and, at least initially, more targeted, than advertised by Pruitt in recent weeks and by the House of Representatives Science Committee’s Chairman Lamar Smith (R-TX), who authored the secret science legislation on which Pruitt’s proposal was to be based and appeared with Pruitt yesterday. But I am sure Dr. Nancy Beck, chemical industry toxicologist turned top political appointee in EPA’s toxics office, could in a heartbeat. Over the last few weeks as forest fires engulfed large areas of California, air quality in the Bay area plummeted. Doctors and pediatricians were on high alert to deal with the health impacts felt most acutely by children and the elderly. Pediatrician’s offices had phone messages that said “If you are concerned about air pollution and calling to make an appointment for your child’s asthma please dial …” and advised citizens to use face masks and air purifiers and stay indoors. News outlets compared air pollution levels there to winter days in Beijing or New Delhi where air pollution is a more consistent threat. These fires drive home the reality of the effect of pollution on health. Time and time again pollution related news from across the country and globe have made headlines, ranging from lead and PFOAS in water Flint and Hoosick Falls, benzene in Houston, to the “Airpocalypse” in Beijing and New Delhi. Though these articles highlight the disastrous effects of pollution from major pollution and weather events, the constant and ongoing silent impact of air pollution on the lives of children and communities remains underappreciated. Today, the Lancet Commission on Pollution and Health, an initiative of The Lancet, the Global Alliance on Health and Pollution (GAHP), Pure Earth, and the Icahn School of Medicine at Mount Sinai, with additional coordination and input from United Nations Environment, United Nations Industrial Development Organization (UNIDO), the World Bank, and others provide the first comprehensive global analysis of the health and economic impacts from all forms of pollution (air, water, soil, occupational). My colleague Elena Craft and I were contributors to this report. 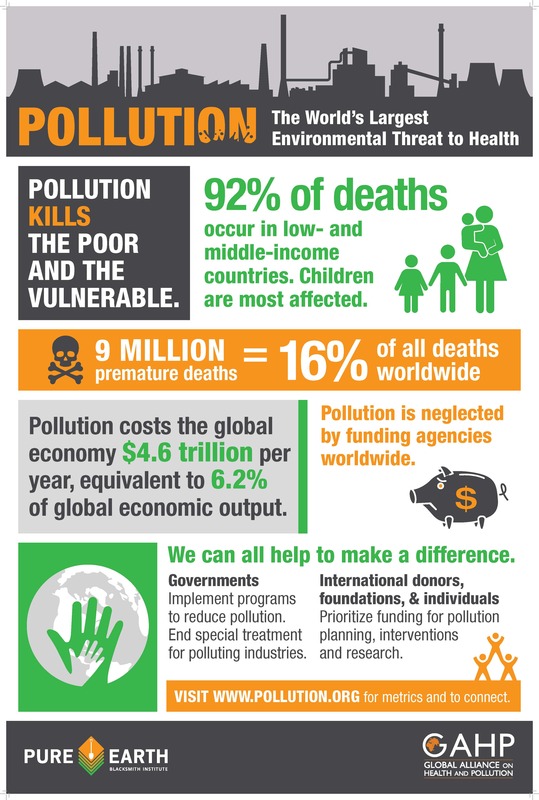 The analysis carried out through the Global Burden of Disease framework estimated that pollution across air, water, soil, and occupational exposures costs the global economy $4.6 trillion per year, approximately 6.2% of global GDP, and resulted in 9 million deaths in 2015. This is equivalent to 16% of all deaths worldwide. Three times more deaths than AIDS, tuberculosis, and malaria combined; and fifteen times more than all wars and other forms of violence.